When Claire of Promenade Plantings asked for guest bloggers I signed up straight away. I do not do a lot of gardening posts on my blog and I thought this would be a great opportunity to expand. If you are interested to read My Fynbos Garden guest post, click here. I wrote about pelargoniums, succulents, black eyed Susans and buchu. To me it is very important to grow a fynbos garden. These plants are indigenous to our area and are therefore water wise. Living in a water scarce region, water wise plants are ideal. They only get watered when it rains. And in the Western Cape that is usually only over the winter months. These plants are grown in our soil which is full of clay. This is because we live at the bottom of a mountain. They are local to Gordons Bay and thrive without much care and attention. There is a prize for one lucky reader who correctly guesses what this is – answers on my blog post please. The winner will be decided at my discretion. Do you have a fynbos garden? If so, what do you have growing in it? 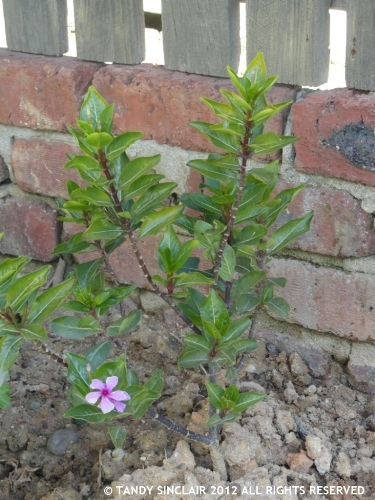 It is Vinca, Tandy, I think! Also called Kanniedood! Apparently tests are being done on this plant for it’s cancer fighting abilities!! I am not aware of this plant but you do have a beautiful garden! Your garden is really lovely, Tandy. Saw your post over at Claire’s – haven’t had much time for commenting the last few days – Pete has been home and we make an impromptu trip away plus being our anniversary took precedence. So difficult to catch up even after just a few days away from blogging. Good for you to take some time out! and nice to have Pete home 🙂 I don’t ever try to catch up – too daunting! Loved the interesting post: so like travelling the world to compare and contract! The flower almost seems like a verbena I grew but am not sure because of the foliage 😉 ! Saw your guest post over at My Promenade Plantings! No idea I’m afraid, but it looks like a bay tree with a very pretty flower.